An adelie penguin goes for a jaunt. Image courtesy of National Geographic. 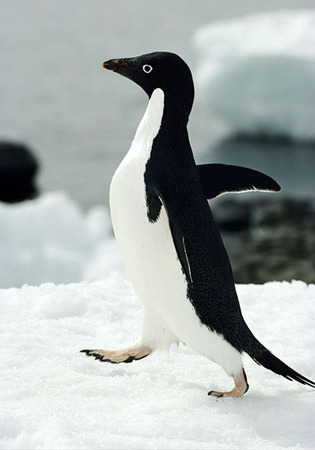 My name is Ms. Bergman and I teach biology at School Without Walls, home of the mighty, fighting penguins. I’m a native of Shepherd Park, in Northwest Washington, DC, and am proud to be back at SWW, where I attended high school! After graduating from SWW, I attended the University of Pittsburgh, where I studied biology, English writing, and medieval studies. My biology education focused on ecology, the study of how organisms interact with each other in their environments, and evolution, the study of how organisms and species change over time. Following college, I worked as a professional writer and editor before becoming a teacher. In addition to biology, my interests include reading (fiction, nonfiction, comic books, etc.) and writing, movies, politics, traveling, and shoes. My goal is to create a positive classroom environment in which students can engage in scientific observation and exploration. I became a teacher because I believe that all students can succeed and that every student should have a positive experience with science, regardless of whether they go into science later in their education or as a career. I aim to create a classroom in which we can explore scientific methods and processes together and encourage each other to think critically about how science influences our daily lives. In particular, I emphasize scientific inquiry as part of the learning experience. Too often students learn only to please teachers or their parents or to simply fulfill assignments’ requirements. Students rarely get the opportunity to experiment with materials and ideas in a setting where they are not penalized if their results do not turn out as expected. Frequently, students are more motivated by fear of doing something wrong – and being graded accordingly as part of the supposedly “authentic assessment” of lab grades – than by genuine interest in science or how science truly works. As such, I hope to incorporate scientific inquiry into my classroom, in particular having students design, carry out, and report about their own experiments. Such large, self-designed projects are more likely to hold student interest, promote higher level thinking skills, and promote organized scientific writing and data analysis. It also shows students that science involves making and correcting mistakes, reconfiguring procedures, and identifying and investigating the sources of inaccuracies in data. In addition, part of being scientists means being scientifically literate – being able to read, interpret, and analyze scientific writing. It is my goal that students are able not only to achieve DC’s academic standards with at least 85 percent proficiency, but also to communicate their scientific knowledge effectively to each other, the School Without Walls community, and the community at large. Creating such a classroom takes effort and commitment from each of my students. I have high expectations of them as students and as members of the School Without Walls community. As such, I expect them to come to class prepared, ready to challenge themselves, and to support their classmates. These elements all work toward a positive, relevant, productive classroom environment. I’ve already learned a lot from your class, in just three weeks!